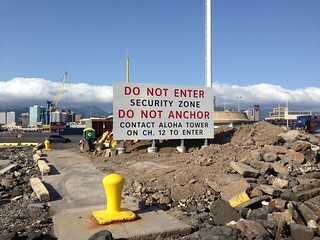 HONOLULU — Construction will be completed on a new boating security sign in Honolulu Harbor, Friday. The new sign will inform mariners of the 24/7 security zone in the harbor and who to contact for permission to enter. It is worded with large letters created using highly reflective tape, will be lit at night and is oriented so that mariners will be able to read the sign while still off-shore, outside the security zone. The previous sign announcing the security zone was difficult to read from outside the security zone and was placed at an angle that made it difficult for vessel traffic entering the harbor. The Harbor Entrance sign is a visible example of the collaborative partnership that exists between the Coast Guard and DOT Harbors in the Port of Honolulu. The sign directs mariners to contact Aloha Tower watchstanders, operated by the Hawaii DOT Harbors Division, who control harbor operations. The sign measures 12 feet by 24 feet and is located on the Diamond Head side of the Honolulu Harbor entrance, Makai side of Pier 1.